When I first saw this game, I thought it was a go app. It has the white and black stones, the wooden playing board, it even has the tinny, generic “Asian” music, so naturally, I was very confused when I quickly realized that it wasn’t go at all, but something entirely different. There wasn’t any tutorial immediately obvious, so I was temporarily stumped until my boyfriend happened to look over my shoulder and went “Oh, it’s Boogers!” Excuse me? Turns out, both Boogers and Quadratus are clones of an old arcade game called Ataxx. Despite its wholly digital origins, it works like a traditional board game where you are trying to capture as much of the board as you can. Like go or chess, the general rules are simple, but it can take a long time to master. Quadratus takes the liberty of always providing a preset board for you, but the rules of moving and capture are always the same, no matter the starting layout. You choose either white or black stones and play on a 10 by 10 grid. On your turn, you can either move one or two spaces in any direction, including diagonal. If you move one space, you get to keep the square you moved from, so you’re actually placing a new stone next to the old one. If you move two spaces, you don’t get a new stone and just hop the old stone to its new place. Whenever you make a move, all of the stones surrounding that new space become yours, so black stones turn to white or vice versa. Of course, stones can also be captured back, so you have to be careful. You take turns, always trying to occupy as much of the board as you can without leaving openings for your opponent to capture your own pieces. Whoever controls the most squares at the end wins. Quadratus is definitely a game aimed at exercising your brain, but it does a downright terrible job of introducing itself, hiding a cramped and confusing explanation of the rules in the help menu. And while the interface works smoothly enough, it also has one very major flaw. In order to see the entire board, you have to be in the main menu. Tapping to play will zoom in on only half the board. It doesn’t seem like a big deal, but I found this tremendously frustrating. Imagine trying to play chess, except you can only see one half of the board at a time. It’s a fairly minor thing; just switch and back forth, right? But when you’re trying to carry a coherent strategy in your head, it’s downright devastating. You have the option of playing against the computer or through a pass-and-play option against a human being. The pass-and-play option wasn’t very well defined, so I didn’t actually realize how it worked at first. The game AI had two different difficulty settings, and it worked fine, but I really could have done without the obnoxious “Q” personality they assigned to it. Q will make comments after every win or loss, and none of them add anything to the game experience. It’s a simple, but interesting game that will definitely appeal to a certain kind of thinker, but I can’t help seriously wishing that the developers had just taken the time to make things clearer and create a seamless playing experience instead of forcing players to awkwardly zoom in and out. Unfortunately, much as I wanted to like it, simple games like Quadratus really suffer from even mild flaws. 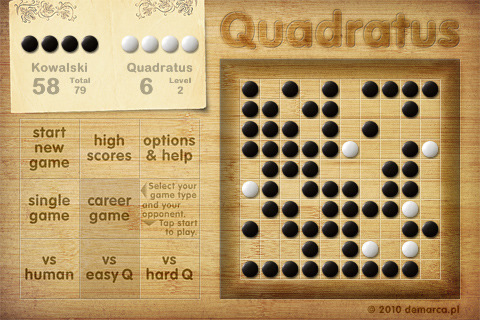 AppSafari review of Quadratus was written by Tracy Yonemoto on April 21st, 2010 and categorized under App Store, Board, Games, Multiplayer, Puzzler, Strategy. Page viewed 4496 times, 1 so far today. Need help on using these apps? Please read the Help Page. It’s generally deep and well written, but I’d like to explain few issues mentioned there. The rules are similar to classic Ataxx, but here you start with partially filled board (randomized), which should give some initial dynamics to the game. You can’t see the entire board while playing, thats right. But the zoomed in view shows not one half, but 70% of entire board (you can’t see only 3 out of 10 rows at a time). This inconvenience has been eliminated in upcoming iPad version. Thanks you for pointing these flaws, we’ll try to correct them as soon as possible.